I am new to 911's and have just picked up a 2008 911 Carrera 4 (Last of the Gen 1's). Having bought it, I immediately took it for a service at a Porsche specialist and asked them to particularly look at the coolant system/water pump as this can be troublesome on these from what I read. I got a list of items that were not factory perfect but seemingly most were suggested by the specialist as common to 911's and not worth changing unless it develops. 3)"All usual exhaust fixings need to be replaced" - I am guessing these are all the nuts and bolts that fit into the joints/mounts? A precautionary warning in case they get seized in? For the sake of a few bolts get it done? What is the situation with this? 5) Slight weep back of gearbox/transfer case, front diff seals and RMS - I have been told all 997's do this, so don't bother with it as it will be back in 6 months ! 6) Ignition coils cracked - Just replace them all with Beru parts? 7) The one that I am less certain of is "alloy coolant pipe o/s/f centre has a trace of coolant. It was suggested that this could wait and see how it develops i.e is there noticeable coolant loss. However I am thinking that it is better to get it sorted. Does anyone know exactly which pipe this is (a picture/link would be great !) and a view as to how challenging it will be to replace? It sound like the 'cross pipes' are the tricky ones and this isnt that? Sounds very much like a quite normal list of minor niggles. I would be doing just as your planning and working my way throught the list . you seem reasonably well informed eg only use Beru coil packs. While I was doing those bits I would also consider an oil change and do it annually or 10k miles especially if you dont know when it was done or what nasty cheap oil was used , trust me Porsche dont know best when it comes to service intervals , also consider plugs when doing coils. if you miles are over 50k I would also think about using a 5w50 oil either Mobil1 or as Hartech reccomend Millers nano plus oil.also think about fitting a low temp thermostat they ore only £50. It actually went into a specialist 20 minutes after making payment , so it has already had a 0w40 Mobil 1 Service and this list of 'things'. Luckily/purposely I have all the old history as well. The last owner (the opposite of technical) also had a service using the same oil, never topped up and it was registering 3/4 full. So another strike lucky for a low consumption 911. The spark plugs (correct bosch parts) are already on order for my next post oil visit survey. The point about the low temp thermostat is a good one and one that I think I will be taking advantage of, as it seems this will reduce the chance of bore score. Chances are that the coolant pipe thats leaking is the NSF one that runs in behind the front drive shafts. You'll need a new flexi pipe to go onto the main pipe back or from the engine bay. The alu cup corrodes as there will be a build up of left over coolant which eventually forces out and you get the leak, the leak then runs down your pipe and drips onto the floor about 2 ft away from where it's leaking so it can be a bit confusing. Pipe is about £25. Front diff seals are an easy fix and ECP sell them and they are the same as Porsche fit. Coil packs are Beru and as it's not a turbo will be relatively easy to do and you can do the plugs at the same time. Water pump is right chew on to get out, you can do it yourself but you might need to remove exhaust. I did mine on my last Turbo and it was a few days work. Get a pump from Autodoc as they are by far the cheapest, in fact get everything from them as you'll save a shed load. 1 / Cars that see a fair few speed bumps in their lifes do suffer from this , its the inner rack arm ball joint that ends up with some play in it. Personnely i would say leave it unless your doing other suspension work. 2 / Same as above , if you had a knocking noise or replaceing shocks / suspension work then you would do these but no rush for now . 3 / The normal ones are the flange bolts ( cat to mainifold ) and the clamp / sleeve bolts. I would flag these up as corroded or heavily corroded with the latter meaning do it now ! Do NOT touch the mainifold bolts unless there is a reason to do so .. yes they might look bad but it will be a world of pain and cost if you are just replaceing these to make it look pretty ... ive never seen one blow yet due to corrosion . 4 / Water pump .. change it . 5 / Leave it and monitor it , IMS leaking and we do it on a scale 1-5. 1 slight misting .. come back in a few years. 2 damp but no drips forming .. come back in a few years. 3 Drips starting to form and oil patch spread out .. customer advised that when he starts to see oil on his garage floor then it will need doing . 4 Drips starting to form and drop onto the floor , if left over night there is an oil patch on the floor .. get it done now . 5 Drips to the point of a trickle of oil coming out ... dont even drive it home .. get a trailer as it needs doing now . Yours sounds like between 1 and 2 . 6 / Cracked coils .. high chance of a misfire if they get wet .. replace and yes Beru . 7 / coolant pipe .. short rubber one i expect under the front undertray . Your antifreeze is pink .. when some comes out it leaves a pink stain , its also crusty like chalk but pink . This is probably what they have seen , it means there has been a tiny leak but its now stopped .. this is due to the antifreeze actually sealing small leaks , its what its designed to do. If this was a Porsche warrenty job they would NOT pay for repairs untill it leaks as this isnt a leak . Ive seen it many times and say the same as your garage . The diff seals sound worth doing then, it sounded like they will weep with new ones as well...but if not, get them changed. Thanks for the Autodoc pointer, I have used them before but had forgotten about them. Out of interest what water pump, is pierburg the only option on these or other good brands like Graf, SKF, Febi, Saleri e.t.c also considered good? Pierburg have added a pretty huge mark up on these. Any recommendation on the waterpump? Is it really just Pierburg for these or do you recommend/use others? Do you also recommend the low temp thermostat? Would you recommend a particular brand? 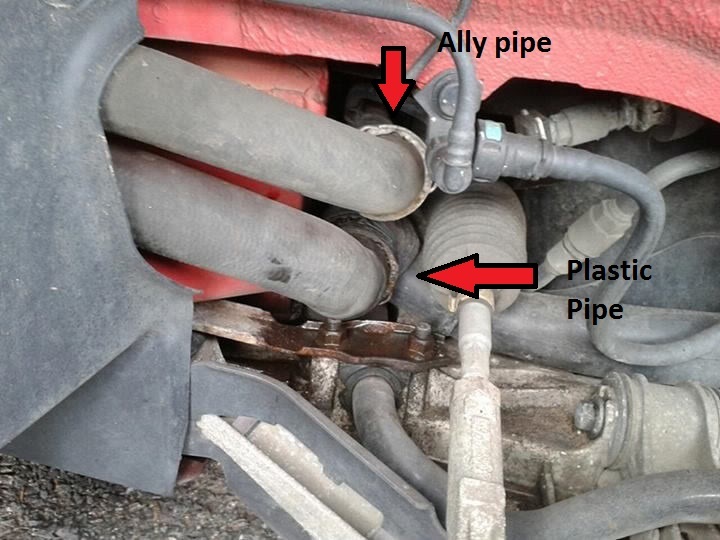 Coolant pipe is interesting, thank you for your view on this. Im sure people here will be able to point you in the right direction. Low temp thermo is a mod thing , again something i dont get involved with. I ordered my water pump through Autodoc and saved nearly £300 over OPC price, when it arrived it was a Pierburg and when I removed the faulty one it was a Pierburg, exactly the same. As for the pipe I'll have to have a look but TBH it's best to see if you can verify which one is leaking first as there are two pipes on the NSF, one is the flow and one the return. They come apart very easily, you literally just pull off the retaining clip and pull it out, obviously half the coolant comes with it! Just so as you know it's not the actual flexi pipe that's leaking it's the aluminium fixing on the male side, they corrode/split and then leak, so if your worried about it going pop I doubt that will happen till it gets really bad. I'm not sure if the cooling system on a C4 is the same as a Turbo, I suspect it will be, maybe Iain can verify this? Re cooling pipes .. i suspect they have flaged up no.28 here .. 2 of them each side .. rubber seal in an ally houseing . As the garage said its not a leak its evidence of a previous leak which is now sealed so its a case of monitor and see if you are actually looseing coolant . I kinda doubt it will be a problem ..
Best way to think of it if your old enough .. put an egg in the coolant system .. it will emulsify and stop leaks .. very old school but the principle of modern antifreeze is the same . Crossover pipes are different ... they corrode . Touch wood, apart from replacing the flange bolts nothing else has needed changing in my last 3 years of ownership, currently monitoring steering arms for replacement at some point though. Maybe a daft question, but I had all of my front hoses & the ally junction replaced under opc warranty a little while ago. Ive heard the corrode from road salts & water spraying onto the poorly made collars from the front wheels in about 5-6 years, would it be wise to coat them in waxoyle or similar now they're new again, anyone know. Or would this affect the rubber hoses life span ? Listen to Phil about the oil. I'm on 77k miles now and into Millers, not Mobil 1, not in 0w40!!!!!! millers 5w40 or if over 70k miles millers 10w50. I bury them in waxoil ... on a Major service or if replacing . You need to attack them from several different angles to get a good covering so a ramp helps a lot . They do suffer in our country due to the salt and the shear amount of water that gets thrown at them . I use Waxoil at work .. but then its what im told to use .. guys here prefer ACF50 .. i actually have a can of this i use for my bike . Personnely id say use what the forum guys say as i belive it lasts longer . Anything you spray will last longer .. except plastic so spray away ! Bear in mind .. 30 years ago we used to spray old engine oil under the car .. anything you use will help . yes .. remove all undertrays .